People are often confused by the terms lesbian, gay, bisexual, transgender, queer and the related acronym LGBTQ. The following definitions will help you to understand these terms. Lesbian A woman whose enduring physical, romantic and/or emotional attraction is to other women. Some lesbians may prefer to identify as gay (adj.) or as gay women. Avoid identifying lesbians as “homosexuals,” a derogatory term (see Offensive Terms to Avoid). Queer Traditionally a pejorative term, queer has been appropriated by some LGBT people to describe themselves. However, it is not universally accepted even within the LGBT community and should be avoided unless quoting or describing someone who self-identifies that way. There are many offensive terms used to describe the LGBTQ and should not be used. These can be found at the GLAAD Media Reference Guide. This guide will help you to identify resources with information on Lesbian, Gay, Bisexual, Transgender, and Queer LGBTQ topics and issues. Due to the interdisciplinary nature of this field, it would be impossible to include all scholarship and information that is available. This guide serves as a starting point for topics and information to consider. If you have questions or need help with your research, please contact a librarian for assistance. 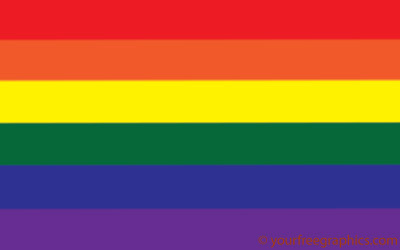 Today, the rainbow flag is a feature of gay pride celebrations around the world, and many lesbians and gay men fly it at their homes. It has been recognized by the International Congress of Flag Makers.